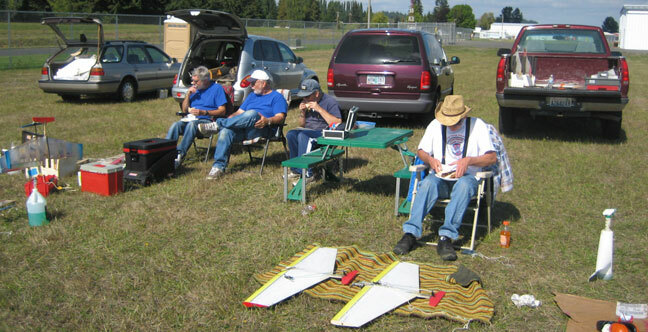 Saturday, Sept. 26, 2009, Chehalis, Wash.
Chehalis Cup Contest No. 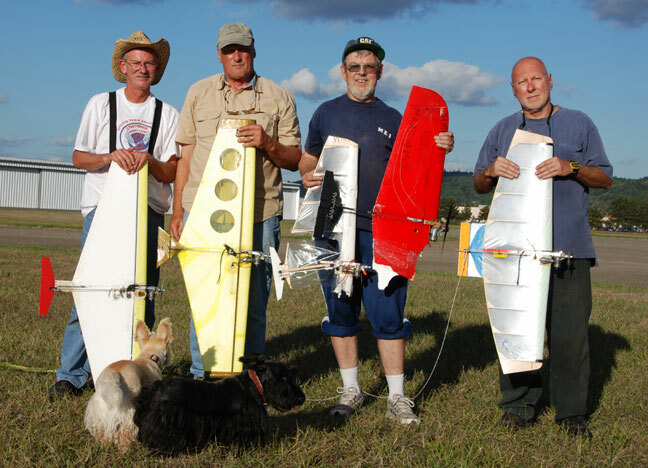 4 top four fliers (in order of finish from left); Jeff Rein, Don McKay, Mel Lyne, Buzz Wilson. Flying Lines photo. The fourth Chehalis Cup contest began under cloudy skies, but we knew it would be a nice day; just had to wait for the fog layer to burn off. What was needed was heat. The first match of the day provided just that -- Jeff Rein and Mel Lyne. From the time the horn sounded, both chased each other over the sky for a full five minutes. In the end, Jeff kept his perfect record. The second match was between Don McKay and Gene Pape with Don winning. The third match was between Robert Smith and me. After getting a cut on Robert, I found myself laying on my back and flying my plane. I have no idea how I wound up on the ground and Robert is not saying. While lying on my back I got a second cut. Robert managed to break his lines and the match was over. John Thompson had a close match flying Bye and was almost disqualified for comments he made about his opponents abilities. After an official warning, John and Bye flew. John won when Bye did not show up in the circle. The sun came out and the weather warmed up as the matches progressed. Most matches were a 1 cut to no cuts or 2 cuts to 1 cut. After two rounds, the grill and Bratwurst were brought out - nothing like combat and cooked meat. The clouds had turned into a beautiful fall day. During lunch, it was decided that the October C-Cup would be canceled because of other commitments for the contestants. Next years season was discussed as well. Gene Pape brought out a shutoff that he is working on. It is a modification of the Bobby Mears' design. 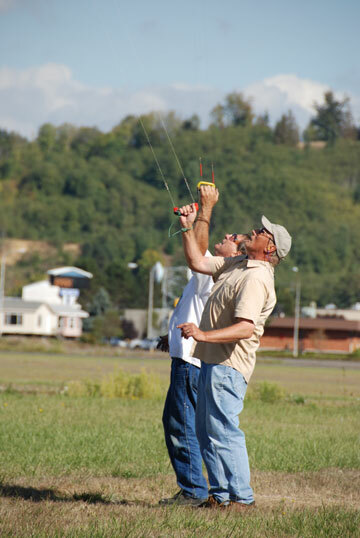 Photo: Bob Smith (left) and Don McKay flying a match. Flying Lines photo. After lunch the final two qualifying rounds were flown. Jeff Rein, Don McKay, and I had made it into the semifinals. There was a three-way tie for the fourth position, Robert Smith, Mel Lyne, and John Thompson. Robert was to fly Mel and John, after apologizing to Bye, would fly Bye. Mel defeated Robert. Once again Bye was nowhere insight and John won. Mel and John would fly for the fourth position. They flew for a full five minutes with Mel securing the fourth position in the semifinals. Jeff Rein would fly Mel and I would fly Don McKay. Jeff beat Mel, and I could not get my engine to run and conceded to Don. Mel and I were to fly for third and fourth, again the PC-4 would not start and Mel would get third. 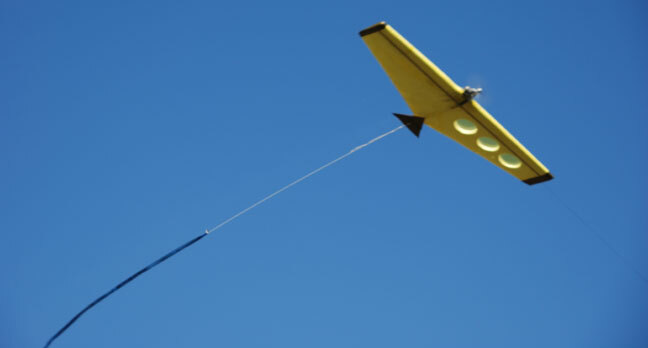 About this time a strong thermal came along and disrupted the pits and took the official score sheet up about 50 feet and sending it outside the flying site. Fortunately we were able to find it. With things back in order it was time for Jeff and Don to fly for first and second. Jeff and Don flew with Jeff winning. It was obvious that engines were getting tired. 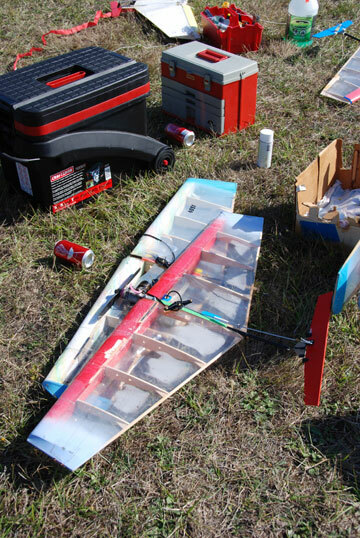 During testing, Jeff Rein had a PC-6 fail. The con rod let go. I had problems with an OS Max 25 FX that would not run. During the semifinals a PC-4 began to fail costing me two matches. Thanks to all who helped for a fun day of combat flying. Attached are the final standings for the 2009 C-Cup. Sunday was to be four rounds of Vintage Diesel Combat. I love the smell of burning leaves and diesel fuel. Six competitors showed up for the Stink Fest: Jeff Rein, Ken Burdick, Don McKay, Robert Smith, Mel Lyne, and myself. It was a beautiful fall day but the wind was blowing strong from the north. It was decided that everyone would fly each other once and if places could not be determined, then fly offs would decide the outcome. The first match was between Jeff Rein and Mel Lyne. Mel got a cut on Jeff and then the wind got Mel. Jeff won on ground time. The second match was between Ken Burdick and Robert Smith. 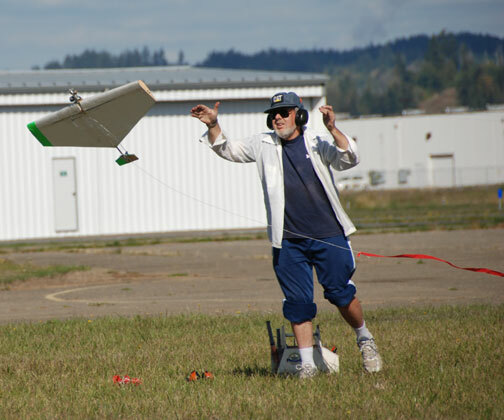 Ken went upwind and watched his Warlord turn into a kite. Seeing this Robert went for the cut and took Ken's lines out at the lead-outs. Robert won on ground time. The third match was between Don McKay and myself. 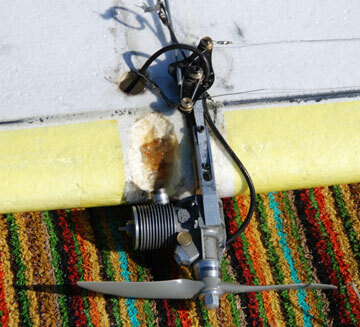 I was flying a Piranha with a new, but sick Sharma. Don was flying a Warlord. Down wind I would do a loop, but up wind it was a challenge and the wind beat the sick engine driving the plane into the ground. Don won on ground time. A pilots meeting was held and the remaining matches canceled because of unsafe conditions. Time to bring out the grill and Bratwurst. After great discussion as to whether the grill would work in the windy conditions, it was fired up and performed better than the diesel engines. Combat flyers and Combat dogs enjoyed the food. Here are the Chehalis Cup #4 results. Northwest Standings Points in parentheses. 6. 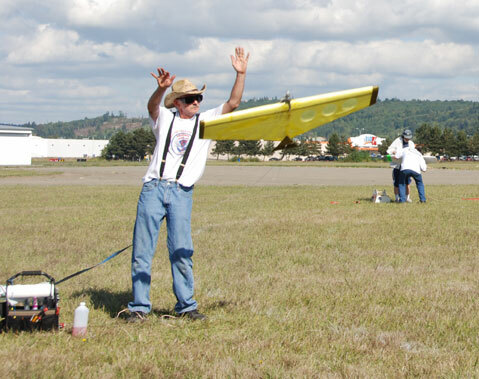 Robert Smith, Roy, Wash.
Photo: Don McKay's plane, up and ready for action. Flying Lines photo. 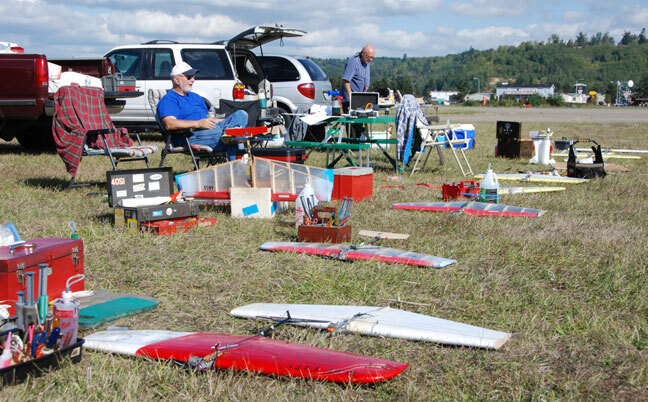 Chehalis Cup planes ready in the pit area. Gene Pape (left) and Buzz Wilson standing by. Flying Lines photo. The one-minute starting period is under way. Jeff Rein (left) holds as Don McKay tunes his engine. In background, Bob Smith gets ready to start as Mel Lyne holds. Flying Lines photo. Left: Business end of one of the F2D-style planes, with .15 power. Note F2D-size H&R shutoff. 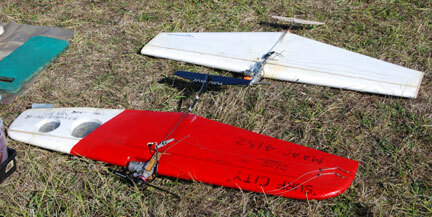 Right: Two of Mel Lyne's planes; at left is an old fast plane now repaired and used for 80mph, at right a .15-powered R&B Rip-Off. Flying Lines photo. Lunch break! Bod Busters cooked up dandy sausage-hot dogs. Buzz Wilson photo. Jeff Rein launches for Don McKay. Flying Lines photo. 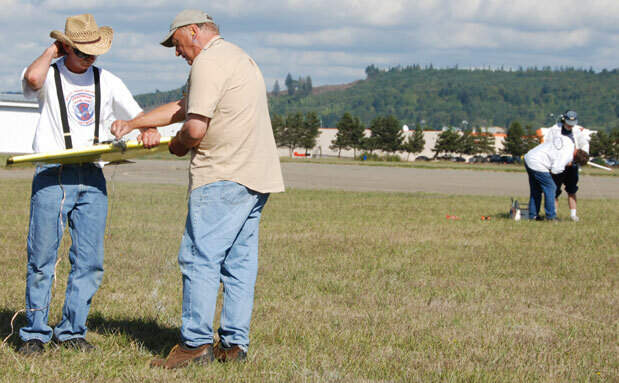 Bob Smith (left) and Mel Lyne work on Bob's plane during a pit stop, as judges Buzz Wilson (left) and Gene Pape watch their ground time stopwatches. Flying Lines photo. Mel Lyne launches Bob Smith's R&B Rip-Off. Flying Lines photo. 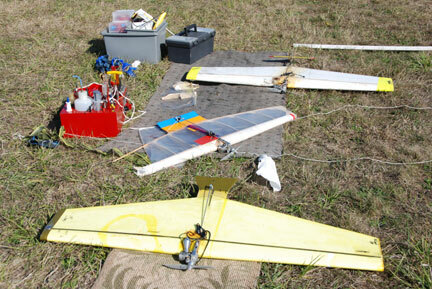 Planes in the pits; some a bit battered from competition. Flying Lines photo.